Hemingway's Cats explores the life of Ernest Hemingway, the women he loved, and the cats and dogs he befriended throughout his life. His animals often helped him to cope with his failing relationships, deep-seated loneliness, and life-threatening diseases. As a cat aficionado, I was intrigued by Hemingway's deep devotion to the family pets. The more I researched this complex writer's life and his close association to animals, the more I came to understand Hemingway the man, the lover, the husband, the father, the hunter, the fisherman, the writer, as well as the devoted master of many cats and dogs. I discovered a kinder, gentler man known only to family and close friends, quite different from the macho character he himself helped to create - a man part fact, part fiction. Carlene Fredericka Brennen, long a newspaper editor and publisher in southwest Florida, has spent over thirty years researching Hemingway's life in Key West, Bimini, and Cuba. She coordinated the International Hemingway Festival on Sanibel Island for three years (1997-99) and the First Annual Hemingway Flats Fishing Tournament on Captiva Island in 1997. Before Hemingway's Cats, she co-wrote with Hilary Hemingway Hemingway in Cuba and worked on the award-winning PBS documentary film by the same name. 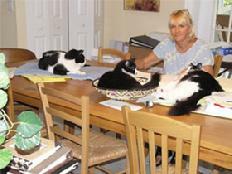 She lives in Fort Myers, Florida with her husband Terry and their three adopted stray cats Charlie Chaplin, Princess of the Wild and Little Kitty. 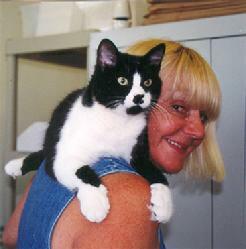 Carlene's fourteen year old beloved cat Bugsy (shown above) passed away December 29th, 2006 from a heart attack.